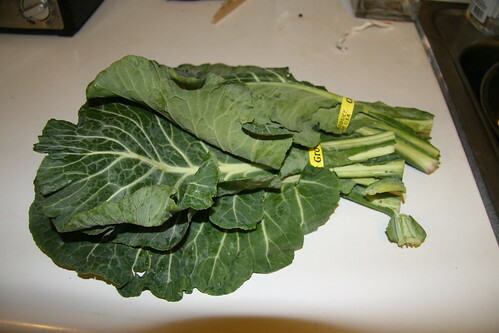 A few weeks ago, Capay Organic was blowing out collard greens for a dollar a bunch, because “no one cooks collard greens.” While I almost always get collard greens when I eat at Southern restaurants, I had never considered cooking them myself. Committed to being one person who does cook collard greens, I brought a bunch home and attempted to cook them Southern style, guided by little more than memory and some suggestions offered by the admittedly vegetarian woman working the Capay Organic table. That Sunday night, we made some cornmeal crusted rock cod and the collard greens. While they both turned out well, both dishes were first attempts, and I identified several things I wanted to do differently. We did a second run of the fish the next night, but the collard greens would wait a couple weeks. Going into this, I really only knew two things about making collard greens: they should be a bit vinegary and you have to cook the hell out of them. My greens dealer had mentioned olive oil and garlic, which made plenty good sense. She also suggested balsamic vinegar and honey. The vinegar I was down with, but the honey didn’t feel like a direction I wanted to go. 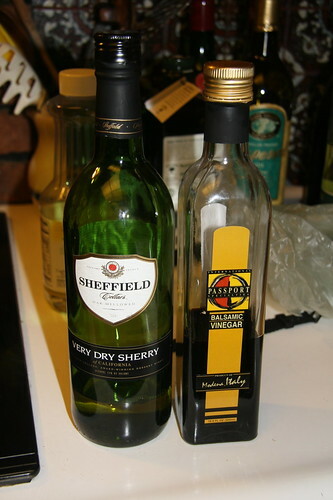 I opted for some dry sherry which would add a touch of sweetness and balance the vinegar while keeping things acidic. To add a bit of spice, I used a teaspoon each of ground mustard and coriander. After the first attempt, Jen immediately hit upon the key ingredient that was missing—and, frankly, I was a bit embarrassed to have missed it—pork. I had somehow forgotten that collard greens are always listed in the not vegetarian section of our favorite Southern restaurant’s menu. For our second round, we were sure to correct this omission. Browsing the Farmers’ Market after picking up two bunches of collard greens, we were pleased to learn of Bledsoe Meats’ new double-smoked slab bacon. John Bledsoe, the friendly and enthusiastic owner of Bledsoe Meats assured us we’d enjoy it (though he later scolded me for using slab bacon and not jowl bacon in my collard greens), and proudly described the 18 hours of smoking it undergoes. I sliced off a couple 1/2″ thick slices of the bacon, then cut those into cubes for a quarter pound of deliciously smoked lardons. Rather than olive oil, I sautÃ©ed the lardons until they were about half cooked, then removed them to another pan to finish. I added chopped garlic to the bacon fat, then the rough chopped collard greens, sherry, balsamic vinegar, mustard and coriander. After stirring the greens around for a couple minutes, I added the now crispy lardons, mixed everything together, and covered to cook for an hour. 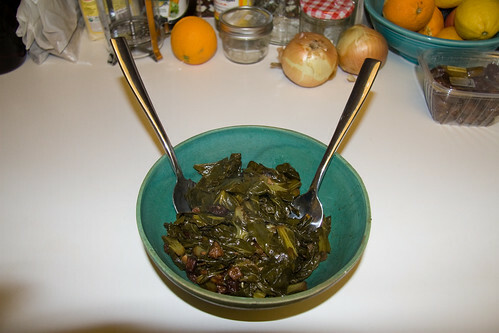 While I can’t claim to have made true Southern collard greens, I was quite pleased with the way they came out. The greens were vinegary and toothsome while not being tough, and the bacon (even if it wasn’t jowl) added a smokiness and heartiness that really rounded out the dish. 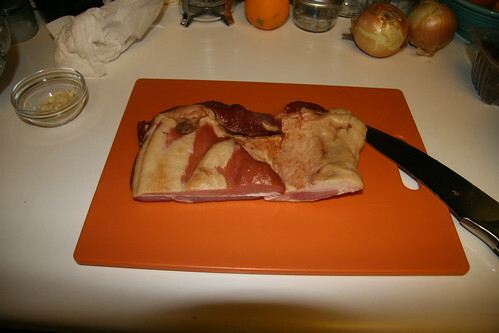 In a large skilled or braising pan, sautÃ© bacon until half cooked. Transfer bacon to another pan to finish cooking and add garlic to pan with bacon fat. 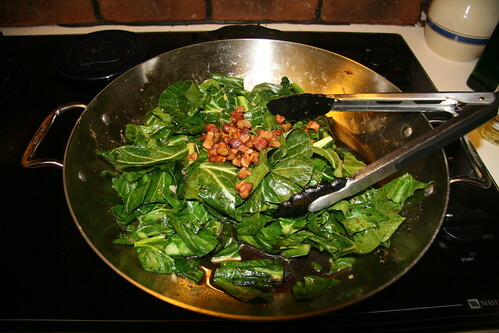 SautÃ© garlic until soft, then add chopped collard greens, mustard and coriander. Toss in pan to mix and cook for 2-3 minutes. Add sherry, vinegar and cooked bacon. Mix and cover. Cook 1 hour. Add salt to taste. More photos of the entire process here.